For our 20th reunion we decided to reach out to local businesses that have supported us from the time we were in high school, as well as businesses of our fellow classmates, to support us once again. Below is a listing of the generous businesses that were kind enough to sponsor our 20th class reunion. We solicited the help of these wonderful sponsors to assist in offsetting the cost of putting on our 20th class reunion. This allowed us to keep the per classmate cost to attend the reunion low, while still providing a fun-filled reunion weekend packed with a list of great events. Please take a moment to read through the below list of sponsors and be sure to ‘Thank” them for supporting our KHS Class of ’86! Heat Transfers, Ball Teams and more! 96 W. County Road 300 S.
3. 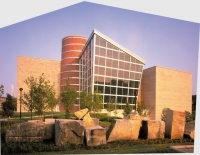 Indiana State Museum - 650 W. Washington St.